Increasingly, scam artists are targeting senior citizens as victims. This is due to the perception that seniors assume honesty in the marketplace and are less likely to take action when defrauded, due to embarrassment. In particular, scammers will seek out seniors who have recently lost a spouse and may be unfamiliar with handling their finances, as well as those who appear isolated from family and friends, or have a physical or mental disability. 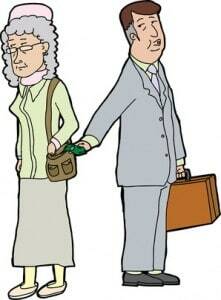 Some of the most common senior scams are outlined below. 1) Telemarketing Fraud– Scammers will call senior’s homes and sell nonexistent investments or goods that never arrive, all to obtain personal information and credit card numbers. Your safest bet is to never give out your credit card number or personal information over the phone to someone who has contacted you. 2) Offering Money– Scammers frequently use e-mail as a means of contacting individuals to let them know they have won the lottery, or have been left an unexpected inheritance by an unknown relative overseas. However, the scammer will say that in order for you to receive your money, you must first use a wire service to send money for fees and/or taxes. Keep in mind that you do not need to pay anyone in order to collect inheritances or lottery money. 3) Faking a Family Emergency– Scammers will contact family members posing as police officers, and state that one of their loved ones is either in jail or has been seriously injured. They then persuade the senior to provide them with money for bail or medical treatment. While this scenario is a highly emotional one, please remember that it is important to verify any information you are given by an unknown party before providing money. 4) Unsolicited Home Repair Work– Scammers will walk the streets of neighborhoods, highly populated with older citizens, looking for the slightest hint of needed repairs. They will then knock on doors and offer to fix the problem they spotted. Once inside your home, they could do a variety of things. One is to work in teams to have one party distract you while the other steals money and valuables. Another is to demand payment for repair work up front and do an incredibly shoddy job of fixing the problem. Yet a third is to start to repair the problem, then claim the issue is much more extensive than they thought, and demand more money to complete the repair. No matter how tempting it may be, do not hire any unsolicited contractors to perform work in your home.